This property occupies the most privileged location in the entire northern part of Antiparos, and boasts great design and comfort to match that. 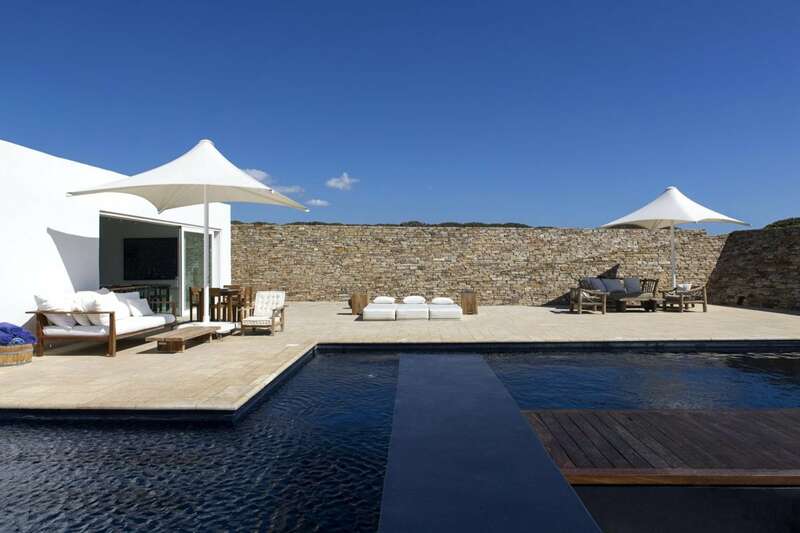 Flagship of OLIAROS’ Antiparos Project, this award-winning residence borrows its name from the man- made hilltop crater in which it is built (kratir is the Ancient Greek word for crater). Its commanding location offers 360-degree views that encompass the entire northern part of Antiparos, and the most spectacular sunsets over the Aegean and the island of Sifnos to the west. A ramp paved with local stone leads up to the main house, whose robust shape references medieval forts and hilltop mansions found all across the Aegean. Kratir was designed by renowned Greek architecture practice DECA in 2003, and was in fact the firm’s first residential project. Inside, spacious living and dining spaces open out onto the outdoor terraces through large glass panels, and an infinity lap pool overflows to create an extension of the horizon beyond. The pool’s black colour creates a “river of lava” that “flows” along the villa, as if it came from the crater in which it is built. The villa is conveniently built close to to the main Antiparos village, but turns its back to the developed part of the island to offer spectacular views of the western terrain and distant islands. A guesthouse is built further below the main villa, and is accessible via a corridor that comes out of the hill. Well-protected from the elements and offering complete privacy despite its prominent location, Kratir captures the best Antiparos has to offer when it comes to an exclusive and comfortable holiday. Kratir is part of OLIAROS’ Pigadakia Masterplan, near the village of Antiparos. OLIAROS curates a complete suite of design, construction, after-sale, maintenance and management services, making the entire process of realising your dream home in Greece completely hassle- free for you.